In Gastown, beer and history go together, as much as french fries and ketchup; you can’t have one without the other. As the birthplace of Vancouver, Gastown is as old it gets when it comes to the remnants of a time that once was. It’s almost impossible to sit in any of our fine watering holes and not have some bit of history sidle up beside you. 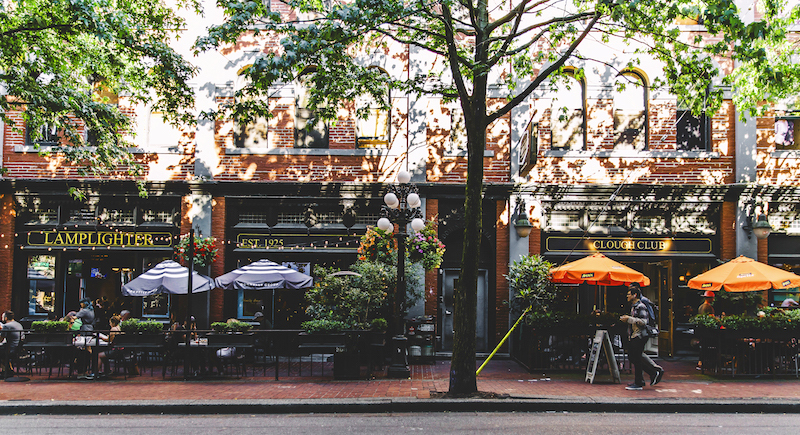 Vancouver is Canada’s craft beer capital and in Gastown, you can chose from well over a hundred different varieties. Come for the beer, stay for the old. The Lamplighter Pub (located at 92 Water St) is one of the most iconic drinking establishments in Gastown, if not, Vancouver. 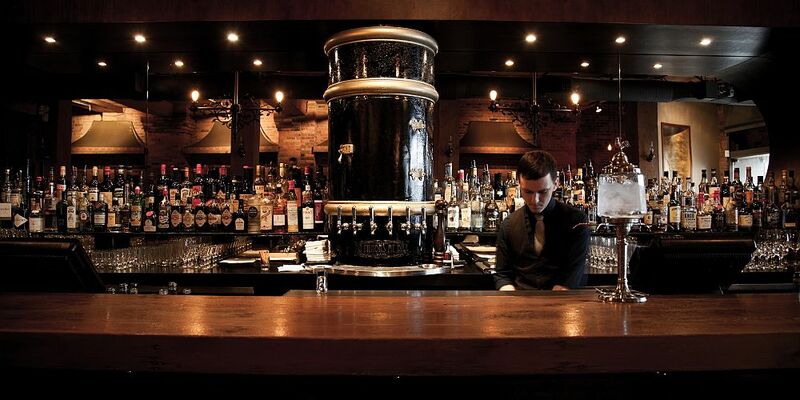 Established in 1925 (and having received Vancouver’s first pub license), this well loved haunt is steeped in history, and blessed with an abundance of craft beer. 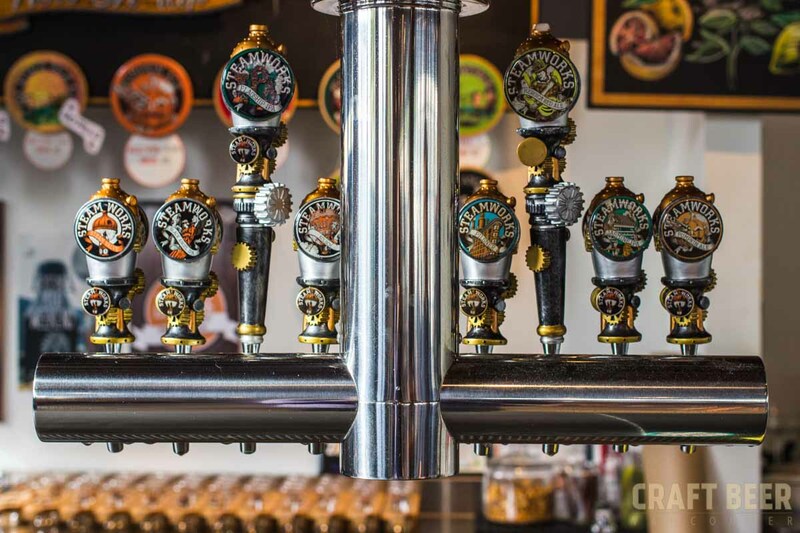 Lamplighter has about 40 beers on tap, including premium ales & bitters, saison, lagers & pilsners, stouts & porters, witbier & hefeweizen, ciders, IPA’s and rotating taps. The Dominion Hotel was one of Gastown’s earliest lodging houses, originally located above a commercial ground floor space. Like others in the area, the Hotel largely catered to seasonal workers in resource trades such as fishing and logging, allowing for both short and long term stays. The first commercial building on the site was a bar. Aptly named: “The Hole-In-The-Wall Saloon”, it was the vision of local pioneer, Joseph Simmons. It was at The Hole In The Wall that the city’s first and only lamplighter, John Clough would spend a considerable amount of his time, relaxing. Today, you’ll find a cocktail lounge hideaway within in The Lamplighter Pub (named after Mr. Clough), suitably called The Clough Club. Steamworks Brew Pub has established itself as one of the most well known and unique microbrewers in BC. In 1995, when we they first occupied their historic Gastown brewpub location, they discovered that the building had a rare steam heat system. Their brewmaster had only read of steam powered brewing, but had never seen a functional steam brewery. These are very rare indeed. They ventured forth, experimented, and created a one-of-a-kind steam generated brewery. The only one in Canada.Steamworks offers 8 of their own crafted beers on tap plus an awesome big patio with incredible views of the North Shore. Recommendations include the deliciously seasonal Summer Ale – which is a wheat ale emitting a distinct citrus aroma, the Frambozen dubbed: “Summer in a glass” which features a ruby-red colour, with a luscious pink head and the taste of sun kissed raspberries, or the new Tropical Tart Ale – pouring a beautiful deep hued gold, and leading with intense tropical fruit aromas. Superfruit Flavours of passionfruit and pomegranate are balanced with an unmistakable thirst quenching tartness; whisking you away to a care-free island paradise. 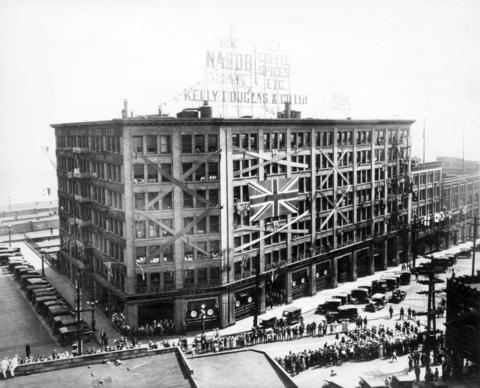 Built 1905, the Kelly Douglas Building, (a.k.a – The Landing), served a the chief warehouse for the The Kelly, Douglas and Co. With seven storeys plus two lower levels, the massive brick-faced warehouse building, is located on the north side of Water Street on the western edge of of Gastown. This vast structure is the single largest building in Gastown, and visually anchors the west end of the district. Kelly, Douglas and Co., co-founded by Robert Kelly and Frank Douglas in 1896, prospered by outfitting the Klondike gold seekers. 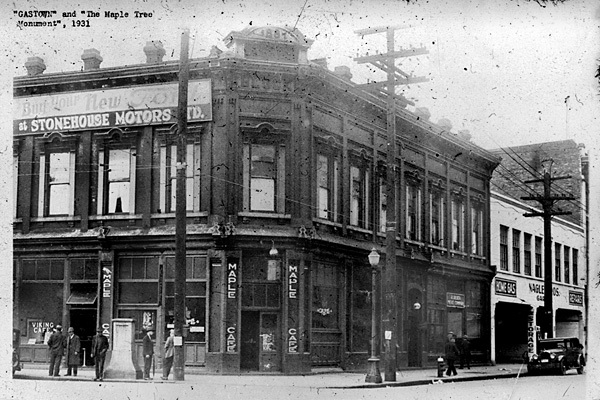 Its location on the western edge of Gastown was also advantageous for direct sales to customers, as the central business district was developing to the west of Gastown. As if doing the Charleston through a time portal, the Pourhouse is a step back through the decades to a time of speakeasies, bootleg gin and jazz. Housed in a 100-year-old building, built in 1910 for the Leckie Boot Company – you’ll find Douglas fir ceilings, supported by large wood pillars, brick walls and antiques. The cornerstone is the 38 ft. Bar – masterfully handcrafted from 120 year-old planks of reclaimed Douglas fir. Draughts include Potts Pilsner -Moon Under Water Brewing Victoria, Jongleur Wit -Strange Fellows Brewing Vancouver, Pale Ale -Four Winds‏ Brewing Delta, Nirvana IPA – 33 Acres Brewing Vancouver, and Stout Postmark Brewing Vancouver. Pourhouse also hosts live music every Sunday through Wednesday night. The J Leckie and Co. Factory and Warehouse/Leckie Building (built 1908), is a massive cubic seven-storey Edwardian era warehouse/factory building located at the southeast corner of Cambie and Water Streets. The first part of the structure was built in 1908 and a large addition to the east was constructed in 1913 (where the Pourhouse resides). Clad in brick and granite, the internal structure of the building is built of massive timber elements. The magic of the Maritimes comes to life at the Portside. 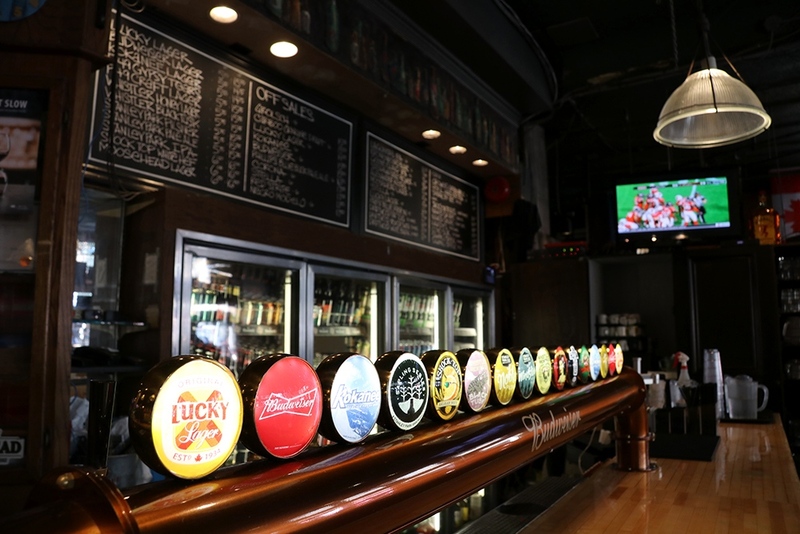 Like stepping aboard a great fishing liner at sea, the pub is split across three levels where pubgoers swagger over to the low-lit bar and take their pick from 24 craft beers on tap. Keeping with the maritime theme, the menu serves up delicious comforts including a Nova Scotia lobster roll and classic Philly cheese steak. Resident DJs spin the latest & greatest motown, hip-hop and dance tracks turning the pub into a nightclub on Thursdays and on weekends. 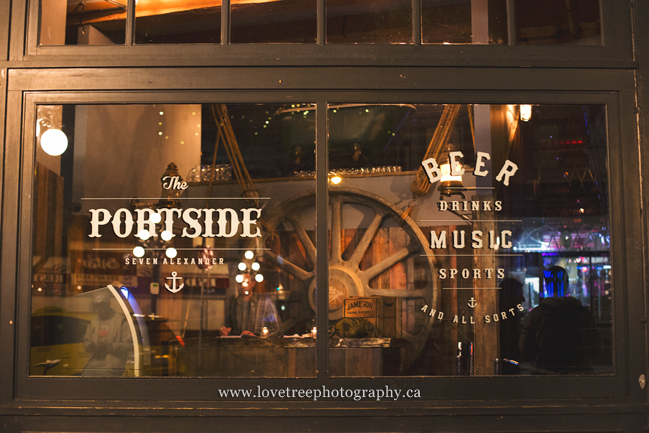 The Portside Pub (#7 Alexander Street – a later addition built in 1908) is housed in the main building of #1 Alexander. Also known as the Dunn Block, #1 Alexander was built in 1899 for Thomas Dunn, a city councillor on the first Vancouver City Council. The building was originally a Japanese rice mill. The Blarney Stone is the only ‘original’, still standing Irish pub in Vancouver. 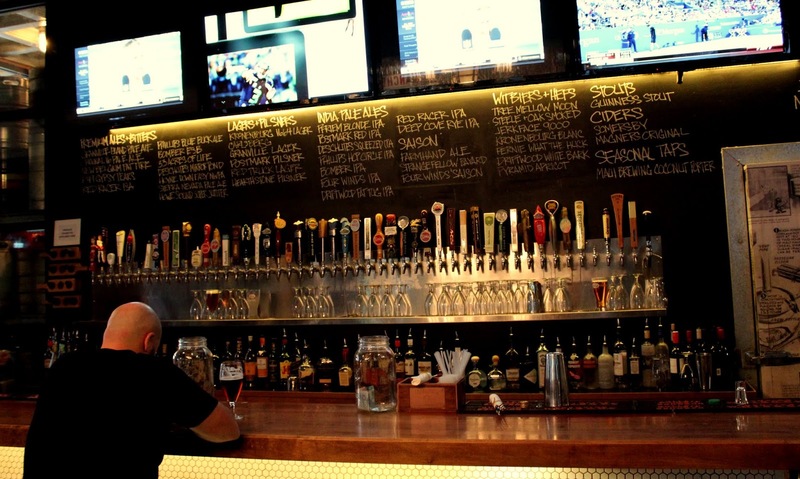 Choose from 8 taps including rotating taps from Stanley Park and Goose Island. Come for the craft beer and stay to party as there’s live music every Friday, Saturday and Sunday night. The building was erected in 1888, and built as The Klondike Hotel. 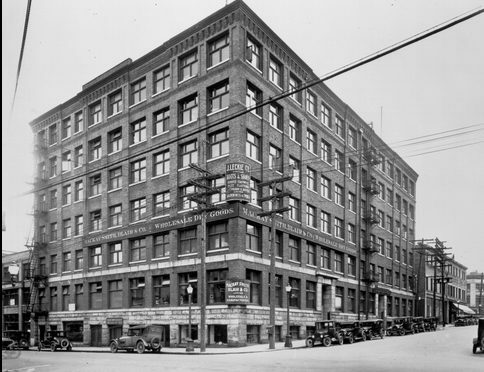 In 1942, the building was converted to Vancouver’s first government liquor store and the upstairs became a rooming house for some of Vancouver’s most notable people, such as the well-known Joe Fortes. 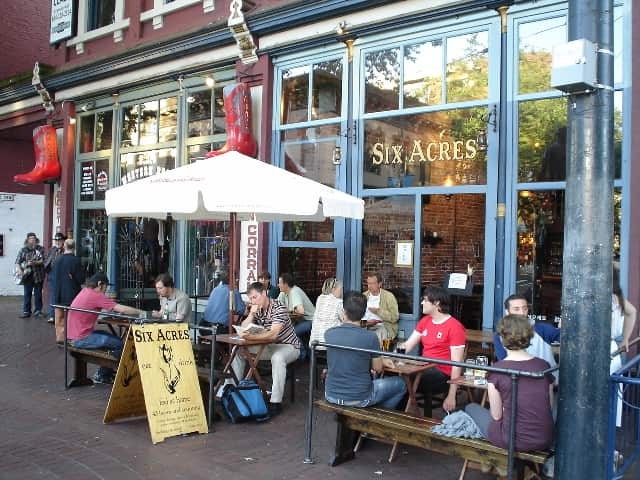 Six Acres is a Gastown hotspot for beer lovers with no less than 15 craft beers on tap. High ceilings, rustic brick walls, friendly staff and a nice patio right on Maple Tree Square with Gassy Jack in permanant attendance. Their extensive collection of crafted brew is sourced predominantly from the lower mainland, the Island and the Us Pacific Northwest including: Brassneck (Del`ta), Four Winds (Del`ta), Sunday Cider (Van`cou’ver), Driftwood (Vic`tor`ia), Central City (Sur`rey), Hoyne (Vic`tor`ia), Gigantic (O`re`gon), Bomber (East Van), Phillips (Vic`tor`ia), Russell (Sur’rey) Pilsner,Townsite (Pow’ell Ri’ver), Upright (Port’land), Persephone (Gib’sons), Merridale (Del`ta), Tofino (Del`ta). The Byrnes Block (aka the Alhambra) located at #2 Water Street was built 1886 and is a two storey, Victorian Italianate commercial brick building developed for Mr. George Brynes who was the Sheriff of Bakerville. Mr. Byrnes purchased a considerable amount of property in Gastown and one of the parcels of land was the site of the burned out Deighton House – which was built and owned by ‘ Gassy’ Jack Deighton before he died in 1875. The Deighton House was destroyed in the Great Fire of 1886 and was replaced by the Byrnes Block, which was built just after the fire in 1886-87. The Byrnes Block embodies the sudden influx in investment capital that flowed into Gastown based on the certainty of growth promised by the arrival of the transcontinental railway. The Irish Heather is the local pub for many and could soon become your new local. A true Celtic gastropub serving classic Irish fare with an extensive whisky list and local and imported pints. Along the bar you’ll find 8 craft beers ranging from a Pale Ale from Whister Brewing, a White Ipa Electric Unicorn by Phillips, an Organic Apple Cider from Orchard Hill to an Extra Special Bitter “Blood Alley Bitter” by Russell Brewing. 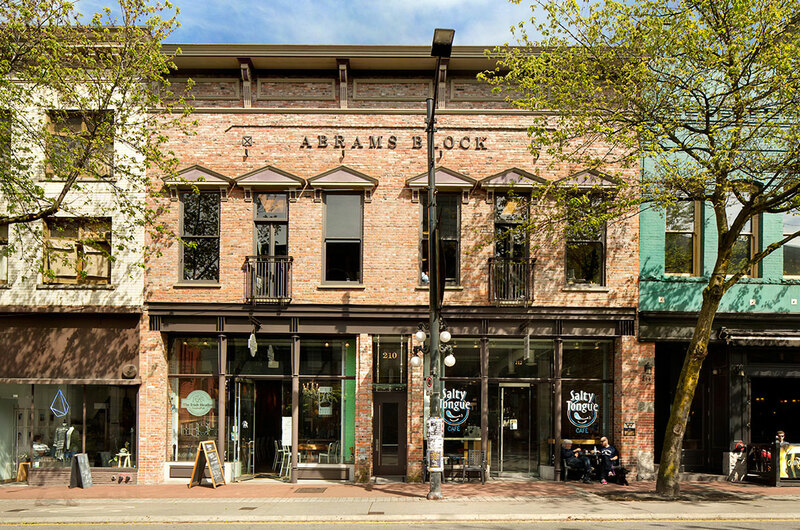 The Abrams Block (built 1887), is a two storey masonry commercial building on the east side of Carrall Street. It is one of the oldest buildings in Vancouver still standing at its original location. 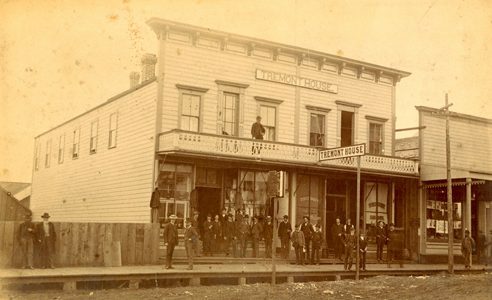 It was originally advertised as Vancouver’s first brick-clad hotel, the Tremont. The building displays the window pediments and bracketed cornice of the Victorian Italianate Style, and typical of frontier hotels, originally had a wooden balcony projecting from the second floor. 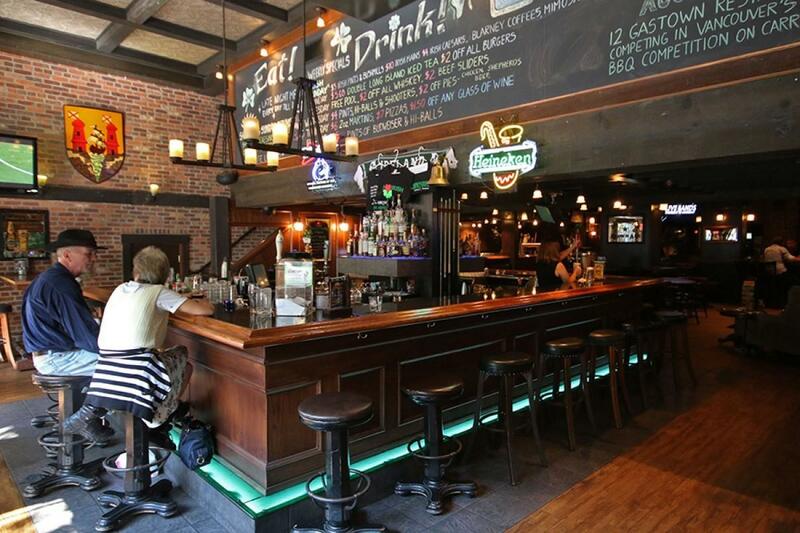 The Cambie Pub caters to large groups with a big open bar space and a lively patio. There are a dozen taps serving craft beer from Parallel 49, Whistler, Stanley Park and ShockTop. 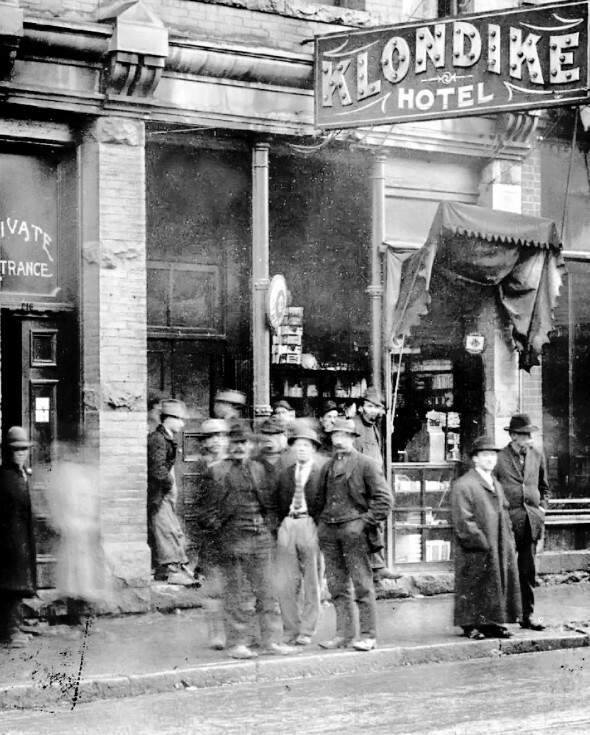 James Stark was the man behind the busines and no stranger to Gastown’s cobblestones. 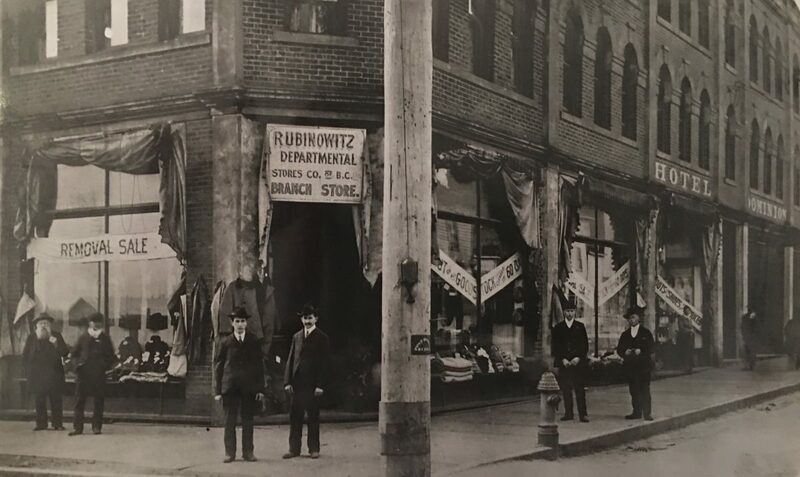 In 1892, he arrived in Vancouver with his family of six and opened a dry goods & millinery store on Carrall Street, and within a few years, relocated his shop to the Dunn – Miller Block on Cordova. 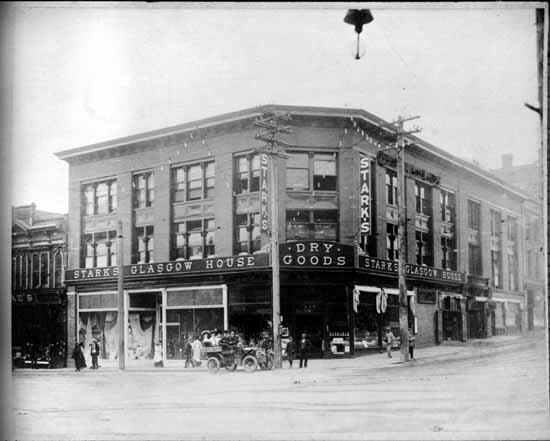 Years later, he moved Stark’s Glasglow House into the historic building on Cordova and Cambie where The Cambie Hostel & Pub sits today. For more years than we can count, The Cambie has become a favourite watering hole to rub elbows with characters from all walks in life.